Take a stroll with us through memory lane, retracing the paths Eleni and Joelle took to eventually create STF Events & Catering. Since it’s inception STF has become one of the premier Murfreesboro caterers, serving clients at events in Nashville, Franklin, and the greater Middle Tennessee areas. In a way, Joelle has always been in the hospitality field. As a PK (preacher’s kid), her parents’ home was always open for guests to drop in, enjoy a meal, or stay overnight. This is where she first learned to serve others and practice hospitality. She was also very fortunate to grow up in a close-knit family and spent a great deal of time at her Grandparent’s home. Both her Poppa Lex and Grandma Mildred were interested in locally-sourced food before it was trendy! They had several acres of farm land, fruit trees, and even a couple of grape vines. Joelle spent her summers planting and picking fruits and vegetables, canning goods, and learning to cook. Upon graduation from high school, she decided to pursue a degree in food service but didn’t quite know how to go about it. She made her way to Campbell University in Buies Creek, North Carolina. There she was able enjoy the full college experience while studying Food Service Management with a minor in Business Administration. After four years, she had the degree, but not enough real-world, practical experience. An internship was the next logical step. The famed Gaylord Opryland Hotel in Nashville offered just that. In the fall of 2000, she began a three-year apprenticeship to learn the ropes of the back of the house in a commercial kitchen setting. This is where Joelle and Eleni met. Eleni’s path to the professional hospitality industry was a little more unconventional. Her love of cooking can be traced back to her Greek and Southern roots. Growing up, she learned how to make traditional Greek dishes from her Mother, who learned to cook for her Greek father. A Memphis native, Eleni was part of a large Greek community and was able to perfect the foods of her heritage. On the flip side, it was her Maw Maw (Grandmother on her Mother’s side) who taught her the art of cooking Southern comfort food. She too grew up eating farm fresh food and gained an appreciation for sourcing and using local ingredients. However, a career in food was not even on her mind. She attended University of Tennessee in Martin and graduated with a bachelor’s degree in Human Environmental Science. While in college, Eleni cooked for her sorority sisters and gained a reputation for her good food. Even though she wasn’t completely satisfied with her chosen career path, Eleni continued her education in the Mental Health field. It was actually at the recommendation of one of her friends that Eleni decided to leave grad school, and a planned career in family and marriage counseling, for culinary school. She opted to start with an apprenticeship at the Gaylord Opryland Hotel in Nashville. Joelle and Eleni had their first rotation together at the Opryland Hotel in room service. There they discussed future dreams and ideas in the culinary industry. Unfortunately, Gaylord’s management decided to end the culinary program after they had they completed just one year. However, the experience gained cooking for thousands, using every piece of commercial cooking equipment known to man, honing skills, and the relationships that were built, are irreplaceable. Now, they, had to find an alternative. Joelle & Eleni decided to go back to school; this time for an Associate’s Degree at Sullivan University in Louisville, KY. Nationally known and recognized, Sullivan was a logical choice because of its close proximity to Nashville and its great reputation. 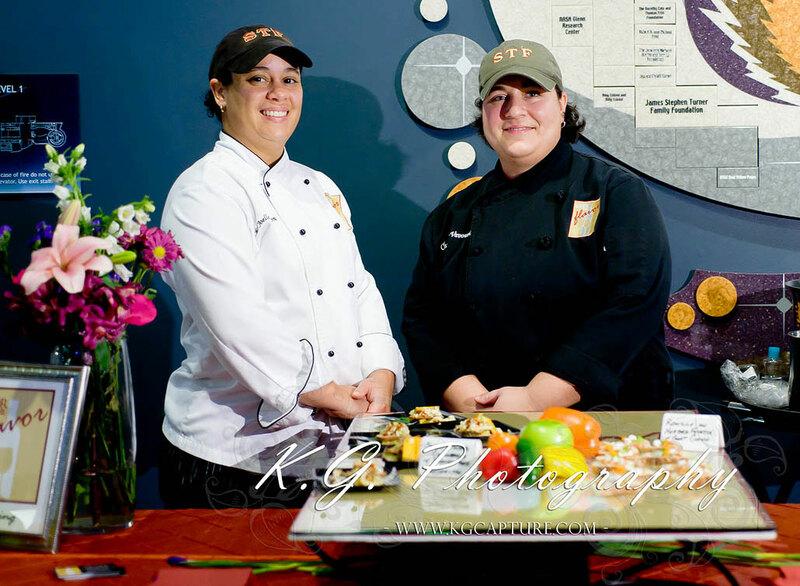 There both earned degrees in Culinary Arts and Professional Catering and received status as certified culinarians through the American Culinary Federation. To this day, they have stayed in contact with several of their chef instructors and are proud to be a part of the Sullivan family. After graduation, both Chefs moved back to the Middle Tennessee area to pursue their culinary dreams. Eleni worked a stint as Executive Chef with the mega food service company Sodexho. Her duties included managing and training a staff of 35, ordering supplies, handling budgets, and writing menus. Though the money was good, the position lacked the opportunity for creativity. Meanwhile, Joelle worked as a Corporate Chef with the Kroger Corporation, opening and operating chef shops in a few select stores. It didn’t take long for either Chef to grow tired of the corporate culture and lack of creative freedom. This is how STF Events & Catering was born. STF became a legal entity in June 2005, Originally under the name “Savor the Flavor”. Within the first year, both Chefs left their jobs to grow their company full time. Since then, Eleni has taken on the role of Executive Chef in the company. She is in charge of menu writing, recipe development, and producing amazing food. Eleni has a particular knack with sauces, spreads, and vinaigrettes and makes all of these items from scratch for every catered event. Despite the conventional wisdom that chefs can’t bake, she is very talented in the pastry department, and can produce everything from cakes to pies to baked goods of all kinds. Because of her Mediterranean background and love of international cuisine, STF’s menus are eclectic, interesting, and uniquely tailored to your event. Because of their background and training, both Eleni & Joelle can flow effortlessly from back of the house duties to front of the house activities. Your event isn’t truly over until we have cleaned up the space and made sure you were pleased with our food and service.